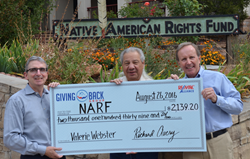 The Giving Back Group and the Native American Rights Fund (NARF) are pleased to announce the formation of a new marketing partnership. The alliance is designed to generate donations made to NARF from their large national community. Whenever the Giving Back Group represents a buyer or a seller in a residential real estate transaction, a donation totaling 20% of the commission earned from that transaction is made to charity. Should a NARF supporter use the Giving Back Group to buy or sell their home, or be referred to an affiliated agent, the donation will be made to NARF or the charity/nonprofit of their choice.